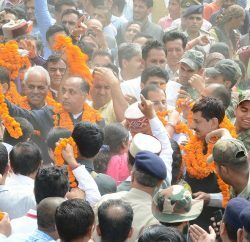 Chief Minister Prem Kumar Dhumal on his Chopal assembly segment tour announced to start classes in Polytechnic College, Chopal from ensuing session. He also perform foundation stone ceremony of 66.KV Electric Sub Centre, Lashtadhar to be constructed at a cost of Rs. 23.56 lakh and dedicating ITI building at Chopal constructed at a cost of Rs. 2.29 crore. Chief Minister also announced Rs. 50 lakh for Solid Waste Management Plant for Chopal, Rs. three lakh for construction of inn building of Shirgul Temple in Gram Panchayat Thana, Rs. two lakh for construction of Mahila Mandal building at Gadrala and Rs. one lakh for construction of paths in Gram Panchayat Chanju. Prof. Dhumal said that work on Lashtadhar Electric Sub Centre would be completed within one year which would solve the low voltage problem of Chopal, Nerva, Deha, Khiraki and Kupvi area. He said that youths were being provided technical training through 14 technical education institutions in Shimla district including Atal Behari Vajpayee Engineering Institute, Pragatinagar and B. Pharmacy Institute, Rohru. Chief Minister said that State Government had performed beyond the promises made during the last assembly elections in the Election Manifesto and had adopted the Election Manifesto as Policy Document. He said that State Government had provided four CFL bulbs free of cost to each domestic consumer by spending Rs. 64 crore thereby saving electricity worth Rs. 110 crore. He said that domestic consumers were being given subsidy of Rs. 1.40 per unit by the State Government and Rs. 190 crore was being given as subsidy for it. He said that to give relief to the people from increasing prices, State Government was giving three pulses, salt and edible oil to the consumers through fair price shops on subsidized rates which had given relief to every section of the society. 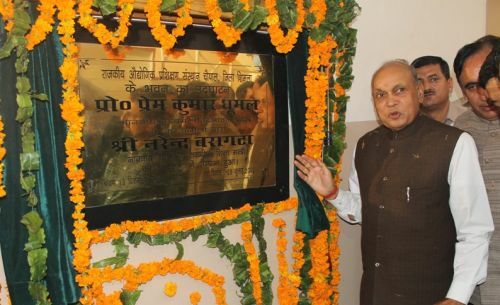 Prof. Dhumal said that State Government had launched various schemes to benefit the people of the State. He said that Atal Swasthya Sewa and Janani Suraksha Schemes had been proved a boon for the people. He said that under Atal School Uniform scheme, two pairs of uniforms were being given to the students from 1st to 10th class in a year besides providing them Rs. 100 as stitching charges for every pair of uniform. Narinder Bragta, Horticulture Minister detailed out the various facilities being provided to the farmers and horticulturists during last four and a half years. He said that Marketing Yard at Parala near Theog was being constructed at a cost of Rs. 100 crore would facilitate the horticulturists of Shimla, Kinnaur, Kullu, Sirmaur and Solan districts. He said that marketing yard at Kharapattar had benefitted the horticulturists. He said that to link Chopal area with Kharapattar a road would be constructed via Bamta. He said that a detailed project report had been prepared for improvement of Parala to Giripul road and work would be started on priority. Seema Mehta, State BJP Executive Member welcomed the Chief Minister. Shashi Dutt Sharma, Member BJYM Executive Committee also spoke on the occasion. Sushil Chauhan, Chairman, Block Committee, Chopal proposed vote of thanks. Surender Chauhan, Member, Zila Parishad, Surender Bhandari, President, BJP Mandal, Kapil Dev, Chairman, Kisan Morcha, Arun Sharma, Deputy Commissioner, Chander Shekhar Sharma, S.P. and other senior officers and prominent persons of the area were present on the occasion.